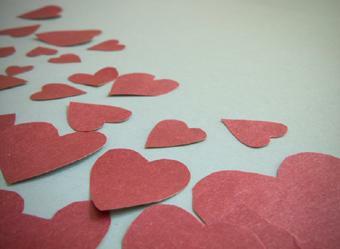 Valentine crafts for kids allow them to be involved in a holiday that is often geared more toward adults. Making special gifts for loved ones helps children express their own feelings on this romantic holiday. Every child needs a holder for Valentine's Day cards and treats. This is a really easy and fun project that allows the kids to get out all the markers, stickers, stencils, glitter, colored paper, and anything else you think might be fun to decorate with. Cut one plate in half. Line up the edges of the two plates and staple around the edge so you have a pocket to put the cards in. Decorate the plates however you like. "Sew" around the edges with ribbon and make a loop to hang the holder from if desired. Another option is to simply use shoebox. Cut a hole in the lid of the shoebox so cards can slide through. Consider decoupaging the box with pink or red paper before decorating. Cut the hearts from different kinds of paper, including red and pink construction paper, flowery papers, even paper doilies. Glue together and let dry. Add a pretty ribbon to complete the wreath. An alternative to heart shapes would be to have each child cut out tracings of his or her hand prints and make a wreath that is shaped like a heart instead of a wreath made out of hearts. Beaded hearts make great holiday decorations. To make a beaded heart, take a pipe cleaner (or heavy-gauge wire for older kids) and bend it into a heart shape. Decorate by sliding red, pink, and white pony beads onto the pipe cleaner. Make a bunch to decorate a tree, give as gifts to teachers, or to use as napkin rings. For younger kids, another idea is to cut out a heart shape from a piece of cardboard. Cover one side of the cardboard with sticky glue or decoupage glue and cover with glitter or beads. Allow to dry and cover with glazing medium or clear Contac paper. Kids can make these hearts in all sizes and would be great to decorate a table, use as coasters, or to adorn a Valentine's package. Barrettes are a great seasonal craft because you can decorate them any way you want. Buy a plain metal barrette from you local craft store. Choose seasonal decorated or colored ribbon, buttons, little decorative silk flowers, lace, homemade bows, or anything else you want to use to decorate your barrette. Wrap the ribbon firmly around the barrette and glue into place with clear-drying glue. You could also make loops in the ribbon and use wire to hold them in place. Sew a decorative button to the top, or glue on other adornments. Consider making a bow of lace and another color of ribbon to glue on top. The sky is the limit. For a great place to store conversation hearts or colored Valentine's candies, try this quick and easy craft. Wash and dry a glass jar and its lid; this can be a baby food jar, a pickle jar, or anything else you have laying around. Paint the lid pink and allow to dry. Decorate the jar with paint pens, stickers, glitter, etc. Allow the paint to dry before filling with candy. If you want to stay away from sugary sweets why not fill the jar with heart-shaped melted crayons that your child made themselves? Crafting should be fun for everyone, so it is important to keep the ages and abilities of the children in mind when choosing a craft. Give them creative freedom to make something that is uniquely their own, whether it is a friendship bracelet for a best friend or a pencil holder for Dad. Homemade crafts help children build confidence while make lasting memories.